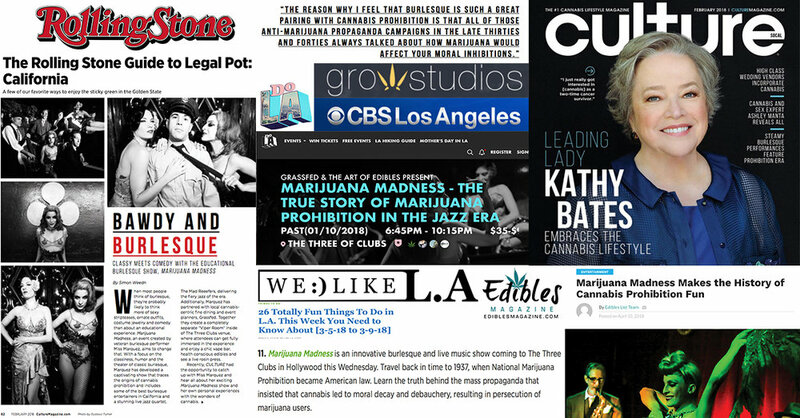 Following the success of Marijuana Madness: Prohibition, the acclaimed 2018 Burlesque Musical set in the 1930-50s, Grassfed and the Miss Marquez are proud to announce in 2019 the second part of the Marijuana Madness series--Marijuana Madness: Revolution, an entirely new hip happening about the (r)evolution of cannabis during the psychedelic era. MARIJUANA PROHIBITION DURING THE JAZZ ERA. OPEN 420 VAPE BAR AND MICRO-DOSED EDIBLE TASTING. Marijuana Madness features World Salsa Champion Carolina Cerisola, known for her unique style that blends Latin flavor with a mix of Burlesque and tease. Carolina’s mesmerizing performances have captured the imagination of many well-known artists including Sting, Prince, Heath Ledger, and CeeLo Green, going on to appear on television shows including The Jimmy Kimmel Show, The Ellen Degeneres Show, Entourage, and The Young and the Restless. Also gracing the stage will be Miss Marquez, innovator of Cannabis themed burlesque performances, and serves as the Artistic Director of Marijuana Madness. Miss Marquez fully embraces cannabis culture with her outlandish cannabis-themed wardrobe and the billowing clouds of smoke that envelop her signature appearances around town. Marijuana Madness features Burlesque performer Amber Marie, a timeless beauty who’s unforgettable performances embody exactly the dangerous allure that those accidental visionary anti-marijuana propagandists were warning against. Los Angeles singer-songwriter Jessie Payo, is known for her brilliant vocal and poetic songwriting. No stranger to the road, Jessie’s opened and performed with everyone from Jason Mraz to Eric Hutchinson, Lauryn Hill, Melissa Etheridge and Toad The Wet Sprocket. Her music has appeared on MTV’s hit series’ “The Hills”, “The City”, “My Super Sweet Sixteen”, ABC’s “Make it or Break it”, FOX’s “So You Think You Can Dance”, CBS’s “Criminal Minds”, and E!’s “The Daily Ten. 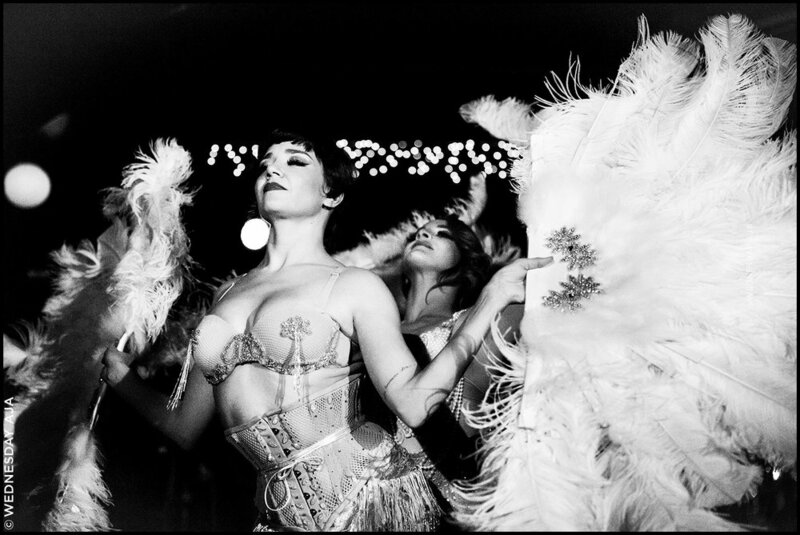 Tying together the narrative of this tale will be international and award-winning burlesque emcee, Tito Bonito aka Cuban Missile Crisis, who was named one of LA Weekly’s People of the Year 2016, and in 2017 took home the award for “most Comedic” at the Burlesque Hall of Fame. The Band bringing the Jazz Era to life us the newly convened THE MAD REEFERS. Featuring some of LA's most sought-after Jazz Musicians. The band includes Willie McNeil (drums), Bill Ungerman (saxophone) Mike Boito (piano), Ollie Steinburg (bass). Notable credits include Bill Ungerman known for his writing and arranging in the swing band ‘Royal Crown Revue’, James Achor who was the co-author of the hit song ‘Hey Pachuco’, and the inimitable Willie McNeil who was the musical director of the famous Hollywood Burlesque club Forty Deuce. In true prohibition style, a separate Viper Lounge will be open before the show, during intermission, and after the show. Viper Lounge guests can elevate and enhance their experience with the signature Grassfed vape-bar, and delectable health conscious treats, while getting an intimate introduction to the cast of the show and penthouse views of the city. Bloomfield, Acclivity, SnowTill, Flow Kana, Reefer City Farms (Flower); Alpine (Vape Pen); VapeXhale & Davinci (Vaping Accessories); Hemper (Cannabis Accessories); To Whom It May, Mondo, Moonman's Mistress, Merry's Berries, Medicine Box (Edibles); Pride Wellness (Hemp CBD); Trichohm, Nug (Concentrate Extracts); Hemper (Accessories), and more.